(Shanghai, CHN)-- The last Day-8 of the World Champs concluded Sunday evening at the Oriental Sports Center in Shanghai. The last finals have been held in the next disciplines: Women's 50 breast, Men's 400 Ind.Medley, Women's 50 Freestyle, Men's 50 Backstroke, Men's 1500 Freestyle, Women's 400 Ind. Medley and Men's 4x100 Medley Relay. The new world champions are: in the women's 50 breast Jessica Hardy USA (30.19); in the men's 400 IM Ryan Lochte USA (4:07.13), in the women's 50 free Therese Alshammar SWE (24.14); in the men's 50 back Liam Tancock GBR (24.50); in the men's 1500 free Yang Sun CHN (14:34.14) - New WR; in the women's 400 ind. medley Elizabeth Beisel USA (4:31.78); in the men's 4x100 medley relay Team USA (Nicholas Thoman, Mark Gangloff, Michael Phelps, Nathan Adrian) with the time of 3:32.06. 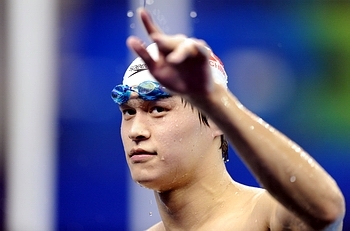 Yang Sun (CHN) - new power of the world swimming sport - new WR in the men's 1500 m freestyle - 14:34.14 (Ph by F.X.Marit). The top start positions for the evening finals at the Oriental Sports Center, have been earned by the next swimmers: in the men's 400 ind.medley Ryan Lochte USA (4:11.89), Yuya Horihata JPN (4:13.68) and Chaosheng Huang CHN (4:14.07); in the women's 400 ind.medley Elizabeth Beisel USA (4:34.95), Mireia Garcia Belmonte ESP as second (4:36.36) and Caitlin Leverenz USA as third (4:36.78); in the men's 4x100 medley relay - USA team (Plummer, Shanteau, McGill, Galle-Weber) with the time of 3:32.42; GER as second (3:33.69) and the third NED (3:34.59). R. Lochte, USA, the owner of 4 gold medals up to Sunday, inlays effort to get the 5th one (today in the 400 IM prelim - 4:11.89)..
(Shanghai, CHN)-- Day-7 of the World Champs concluded Saturday evening at the Oriental Sports Center.Six finals were at the program this afternoon (Women's 50m Butterfly, Men's 50m Freestyle, Women's 200m Backstroke, Men's 100m Butterfly, Women's 800m Freestyle and Women's 4x100m Medley Relay) as well as three SFs (Women's 50m Breaststroke, Women's 50m Freestyle, Men's 50m Backstroke). M.Phelps - never beaten in "his" 100 Fly (Ph by AFP/P.Parks). (Shanghai, CHN)-- Day-7 of the World Champs started Saturday morning at the Oriental Sports Center. The qualifications in five disciplines concluded this morning: women's 50 free, women's 50 breast, men's 50 back, women's 4x10 medley relay and the men's 1500 free. Top postitions for semi finals and the best times in the preliminaries were set by next arhletes: in the W 50 free T.Alshammar SWE and J.Hardy USA (24.82); in the W 50 breast Jessica Hardy USA (30.20); in the M 50 back Gerhard Zandberg RSA (24.72); in the W 4x100 medley relay USA Team (3:56.95); in the M 1500 free Yang Sun CHN (14:48.13). The only SRB athlete in the evening finals has been Nadja Higl who took part in the women's 200 breast. From the lane 8, Nadja succeeded to climb to the 6th position at the end with the time of 2:25.93 (again better then the Fina A standard for London 2012)... Congratulations !!! 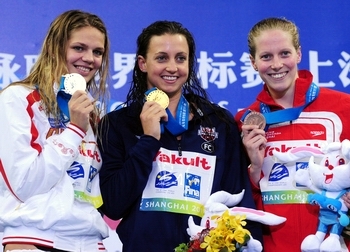 (Shanghai, CHN)-- Day-6 of the World Swim Champs started Friday with the morning qualifications. 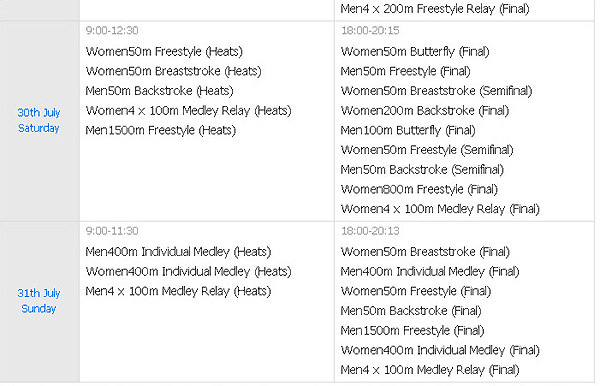 Six disciplines were in the program (M 50 free, W 50 fly, M 100 fly, W 200 back, M 4x200 free relay and W 800 free). The only athletes from the Serbian Swimming Team in the morning prelims were Mike Cavic and Ivan Lendjer both in the same discipline, the men's 100 fly. Unfortunately, from the heat 9/9 (lane 2), Mike Cavic swam out his race with the time of 52.67 and was ranked 18th overall of 65 participants, while Ivan Lendjer from the heat 7/9 (lane 7) went in 53.14 which helped him placed 24th. Top positiions this morning, for the evening semi finals were earned by next athletes: in the M 50 free Cesar Cielo Filho BRA and Nathan Adrian USA (both same 22.03); in the W 50 fly Therese Alshammar SWE (25.68) and Jeanette Ottesen DEN (25.88); in the M 100 fly Tyler McGill USA (51.76 ); in the W 200 back Melissa Franklin USA (2:07.71), etc. 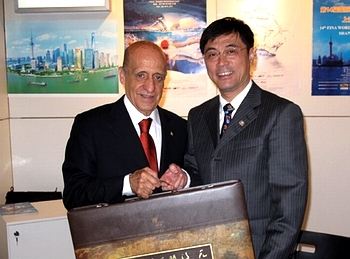 M.Cavic - Shanghai is just a step towards London 2012. (Shanghai, CHN)-- Day-5 of the World Swim Champs concluded Thursday evening with the five finals (M 200 Ind.Medley, M 100 free, W 200 fly, W 50 back and W 4x200 free relay) and 4 SFs. The only athlete from Serbia in the evening events was Nadja Higl, World Champion, who succeeded to catch the final in the women's 200 breast with the time of 2:25.56 (ranked 8th). 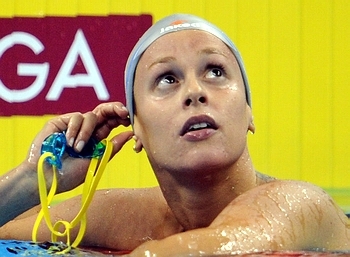 Nadja also caught the standard in the 200 breast for the London 2012. Two athletes from the Serbian swimming team took part in the morning events at the Oriental Sports Center in Shanghai. Miroslava Najdanovski in the women's 100 free climbed to the 36th position (of 77 participants) with the time of 56.42. Nadja Higl, in the women's 200 breast ranked 11th in 2:27.39 which assured her a place for semi finals. (Shanghai, CHN)-- Day-4 of the World Champs concluded Wednesday evening. 4 finals and 4 SFs were at the program. New world champions became the next athletes: in the men's 200 fly, Michael Phelps USA with the time of 1:53.34; in the women's 200 free Federica Pellegrini ITA (1:55.58); in the men's 800 free Yang Sun CHN (7:38.57); in the men's 50 breast Felipe Franca De Silva BRA (27.01). Top positiioned for the tommorrow's SFs were the next athletes: in the M 100 free James Magnussen AUS (47.90); in the W 50 back Anastasia Zueva RUS (27.88); in the W 200 fly Jemma Lowe GBR (2:06.30) and in the M 200 IM Ryan Lochte USA (1:56.74). F.Pellegrini ITA, world super star, confirmed her world potency. 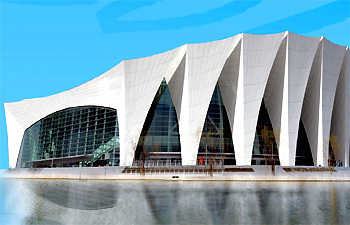 (Shanghai, CHN)-- Day-4 of the World Champs started Wednesday morning in Shanghai by the Oriental Sports Center. 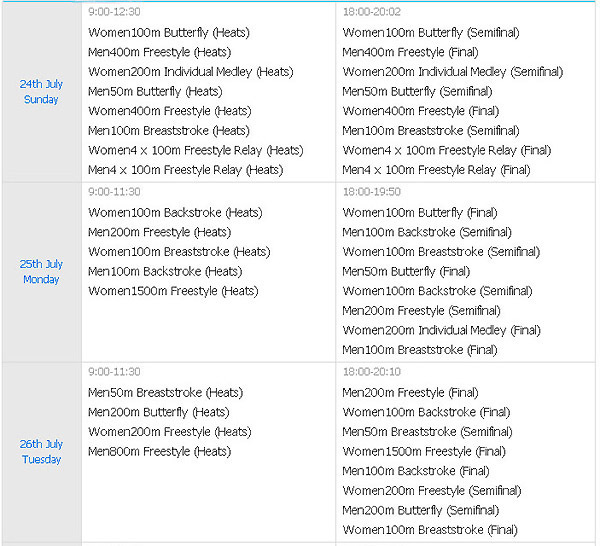 Four disciplines were at the program in the morning preliminaries (W 50 back, M 100 free, W 200 butterfly and M 200 Ind. Medley). From the Serbian participants, the only athletes who took part in today's events was Velimir Stjepanovic. In the men's 100 free preliminaries, from the heat 11 (lane 7), Stjepanovic did his best and touched the wall as 37th of 106 participants with the time of 50.14. 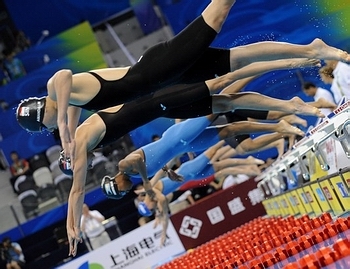 (Shanghai, CHN)-- Day-3 of the 14th Fina World Champs started Tuesday morning in Shanghai. 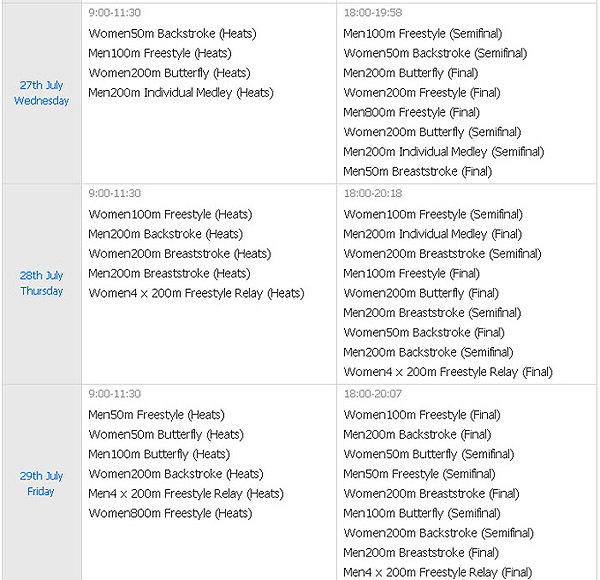 Four disciplines were at the program in the morning preliminaries (M 50 breast, M 200 fly, W 200 free and M 800 free). Top positiions for the evening SFs and Finals were set by the next athletes: in the men' 50 breast Franca Da Silva Felipe BRA (27.19); in the men's 200 fly Dinko Jukic AUT (1:55.26); in the women's 200 free Allison Schmitt USA (1:56.66) and in the men's 800 free Yang Sun CHN (7:45.29). (Shanghai, CHN)-- Day-3 of the 14th Fina World Champs concluded in Shanghai with the extremely marvelous "battles". Five finals were at the program in the evening (M 200 free, W 100 back, W 1500 free, M 100 back and W 100 breast). Serbian star, Caba Siladji in the men's 50 breast SFs did not succeed to catch his final in Shanghai, however for his nation, getting into world Top-16 is an extremely great accomplishment (27.89)... Congratulations !!! 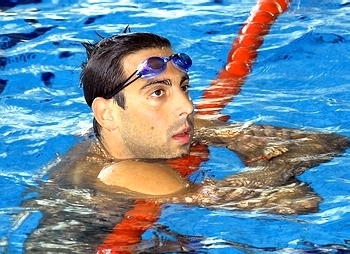 From the Serbian participants, Radovan Siljevski (1986) took part in the men's 200 Free preliminaries. 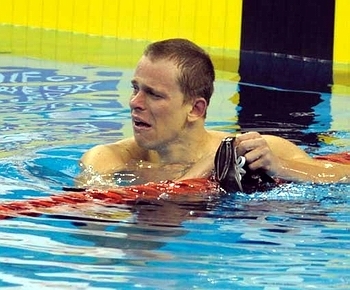 Among 60 swimmers, he ranked 35th with the time of 1:52.42 (entered with 1:49.79). R.Siljevski and Serb Physiotherapist Bukvic by the competition pool deck, day prior to the Championships start (Ph by V.Anusic)..
(Shanghai, CHN)--- In the Day-2 evening finals, many spectacular sparkles could be seen. Cesar Cielo Filho (BRA) has definitively solid nerves. 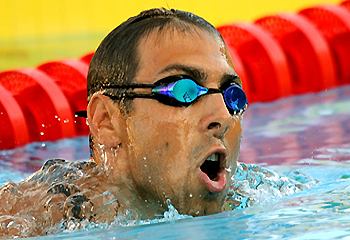 First Olympic champion for Brazil in 2008 (50 free), he touched the sky in 2009 after winning the 50 and 100 free races at the World Champs in Rome (ITA). “Positive” nerves, one would say: you train, you make splendid races, you win, and you receive your medal (occasions in which he often cries…). Cielo has since then become a legend in Brazil. He is one of the most prestigious ambassadors of the Olympics Rio 2016. Two months ago, his world turned upside down: after taking his nutritional supplement, a positive doping test led to a warning from his National Federation. FINA appealed the case to the Court of Arbitration for Sport (CAS) and the Olympic champion had to wait for an audience held while he was already in Shanghai to know if he could swim at the champs: the verdict was a relief for him. The warning sanction was validated by TAS and Cielo was free to shine in the pool. In the evening finals in the M 50 fly, Cielo ranked 1st in 23.10. In four other finals, new world champions became: Dana Vollmer USA in the W 100 fly (56.87); in the W 200 IM, Shiwen Ye CHN earned gold medal with the time of 2:08.90; in the M 100 breast Alexander Dale Oen NOR won in 58.71. From the SRB Team, top time is set by Ivan Ledjer. In the morning heats in the 50 fly, with the time of 23.51, Lendjer ranked 6th. In the same event, Milorad Cavic placed 12th in 23.76. In this event, few great world swimmers missed to catch the SFs, such as Peter Mankoc (SLO) - 24.01 (19th); Mario Todorovic (CRO) - 24.05 (20th), Cullen Jones (USA) - 24.19 (23rd), etc. In the evening SFs, Lendjer ranked 11th (23.54), while Cavic 12th (23.59). Caba Siladji, in the men's 100 breast qualification placed 31st with the time of 1:01.59 (entered with 1:01.93), while in the men's 400 free, Velimir Stjepanovic ranked 26th in 3:54.87. 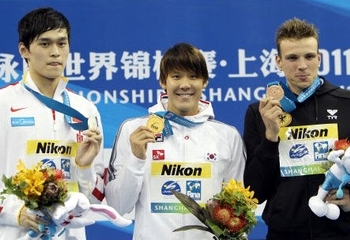 After winning the men’s 400 free at the 2007 FINA World Championships in Melbourne (AUS) and reinforcing his status of Korean star at the Beijing 2008 Olympic Games (gold in the men’s 400 free and a silver in the 200), Tae Hwan Park did not appear in great shape at the 2009 Worlds in Rome (ITA), finishing only 12th in the longest distance. In 2010, Park seemed to have recovered, with victories in the 100, 200 and 400 of the Asian Games. In Shanghai, he confirmed that he is back to the top, winning the first swimming final of the programme at the 14th FINA World Championships Shanghai 2011, precisely the 400m free, in a time of 3:42.04. It was the third fastest 400m victory in the history of the FINA World Championships, after the 3:40.17 triumph of Ian Thorpe (AUS, 2001) and the 2009 win of Paul Biedermann (GER, 3:40.07, the current World Record). At 21, Park demonstrates that he is ready for the 2012 Olympic celebration in London (GBR). Park - gold medal (3: 42.04), China’s Sun Yang finished in 3:43.24, while 2009 champion Paul Biedermann of Germany took bronze..
Milorad Cavic: "I feel water under my fingers..."
(Shanghai, CHN)--- For the popular Belgrade sports media the Sportski Zurnal, Mike Cavic, Olympic Vice Champion and the World Champion, gave an exclusive interview in the Shangai's Hotel Hua Ting. With some kind of positive energy, Cavic reminds readers on the first steps at the World Championships held in Fukuoka, Japan in the course of 2001. He also used to mention the participation in the Sydney Olympics in 2000 when he was just 17. “In Melbourne 2007, I have arrived after two months of preparation and was twice ranked 6th. Have to be mentioned that in the course of 2006, I almost said good bye to swimming. However, in Melbourne, I caught the ticket for Beijing Olympics." Cavic also added: “The World Championship Rome 2009 was the spectacle. The gold medal in the 50 Fly, and after that a "battle" against Michael Phelps. Almost all people lived for that race and considered it as a replay on the Beijing 2008. In spite I've earned silver medal, I think the preassure has not been solved. But I learned something. That might help me at the London 2012." 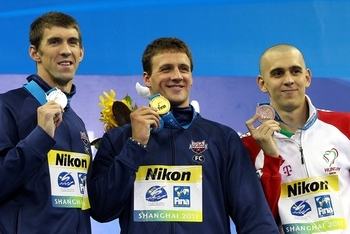 (Shanghai, CHN)--- Michael Phelps came back to the country where he has earned the name of the world swim king. The triumphant pictures of Phelps with his eight Beijing gold medals hanged around his neck cannot be forgotten. Now he is back with the aim to repreat the same positions at the podium. However, one can neglect the cover pages of many yellow magazines after a British newspaper ran a photo of Phelps nuzzling a marijuana pipe in early 2009. But he stayed calm reconsidering his plans to continue swimming through the 2012 Olympic Games. For the media yesterday, Phelps said: "After having messed around for two years it's hard to know where I stand," as he started acclimatization here in Shanghai for the start of racing in the competition pool on Sunday. "I'm taking steps in the right direction and I know that, and I think that's something that I'm fairly happy with." Now Phelps is 26. All eyes are steered to him and his new accomplishments. His coach Bob Bowman could do little but he has little doubt that Phelps can add to his Olympic legacy in London. (Shanghai, CHN)--- With the presence of 152 National Federations, FINA held its Extraordinary Congress today in Shanghai (CHN), with one main point in the Agenda: the approval of FINA’s new Constitutional Rules. “We have followed a democratic and crystal clear process throughout the entire preparation of this Congress, by which the National Federations had the opportunity to express their opinion and to propose their recommendations”, considered the FINA President Dr. Julio C. Maglione, while addressing the delegates of the Congress. “This Extraordinary Congress certainly constitutes a step forward in FINA’s history. It is aimed at adapting our International Federation to the competitive and challenging demands of the 21st century. These changes will raise the functionality of FINA and will help in securing our Federation a distinguished place among the most prestigious and respected Sports in the five continents”, Maglione concluded. (Shanghai, CHN)--- Last official info that has come to our staff says that the last competitor of the Serbian National team (Velimir Stjepanovic) arrived Shanghai with his coach Chris Tidey and now starts with the acclimatization. Other members of the team (Cavic, Lendjer, Higl, Siladji, Sorak, Siljevski and Najdanovski) have already felt the water in the training pool as well as the competition Oriental pool and the climate these days in China. The final roster of the Serbian swim team for the upcoming 14th FINA World Swimming Championships "Shanghai 2011" that is going to be held in the Republic of China, City of Shanghai from 24 to 31 of July 2011 is defined and entered. The complete team has already arrived China, and few practices were held, also the period of aclimatisation started. The national selection of Serbia for the World Championships will be consisted of the next participants: Milorad Cavic (50 Fly and 100 Fly); Radovan Siljevski (200 free); Ivan Lendjer (50 & 100 Fly), Caba Siladji (50, 100 Breaststroke), Nadja Higl (200 Breaststroke), Velimir Stjepanovic (100 & 400 Free and 200 fly) and Miroslava Najdanovski (50 & 100 Free)... Coaches of the Serbian swim team in Shanghai: Dejan Pejinovic (Head Coach of the National Selection); Sebastijan Higl (from SC Tamis, Pancevo) , Andrea Di Nino (ADN Swim Project, Italy) and Chris Tidey (Hamilton Aquarics, UAE).